Since ancient times, saffron was regarded as one of the highly praised spices, known for its orange color, taste and medicinal properties. Rich in vitamins and minerals, but also because of its therapeutic effect, is still used in Eastern medicine today. This exotic spice originates from southern Europe and is now being cultivated all over the world in many countries, especially in Spain, Italy, France, Greece, Turkey, Iran, and in the Indian states of Jammu and Kashmir. Crocus sativus plant grows to about 15-20 cm high. Saffron requires cold and dry climate with well-drained and rich soil. The flowers are usually picked in the early morning hours. Saffron has a special taste that comes from chemical compounds in it, such as picrocrocin and safranal. It also contains the natural carotenoid chemical compound crocin, which gives the saffron its golden-yellow color. These properties together with other medicinal properties make it a valuable ingredient in many kitchens around the world. Saffron contains several chemical compounds derived from plants that are known to have anti-oxidant properties. 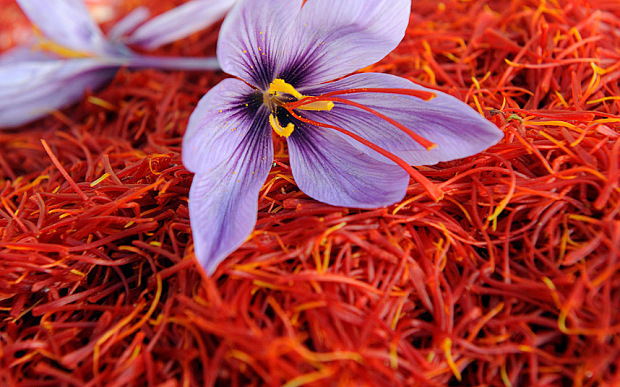 Saffron is rich in oils, of which the most efficient is safranal that gives the saffron a characteristic flavor. Other volatile oils are cineol, phenethenol, pinen, borneol, geraniol, limonene, p-cinnamon, linalol, terpinen oil. This vivid spice has many non-volatile active ingredients. The most important of them is crocin. It also contains other carotenoids, including Zea-kanthin, lycopene, A and SS carotene. These are important antioxidants that help protect the human body from cancer, infections and act as an immunomodulatory agent. Active ingredients of saffron have many therapeutic uses in traditional drugs as an antiseptic, antidepressant, antioxidant. Saffron is a good source of minerals such as copper, potassium, calcium, manganese, iron, selenium, zinc and magnesium. Potassium is an important component of cells and body fluids that help control heart and blood pressure. Manganese and copper are used by the human body as co-factors for the antioxidant enzyme. Iron is essential for the production of red blood cells. In addition, it is also rich in many vital vitamins, including vitamin A, folic acid, riboflavin, niacin, vitamin C, which are essential for optimal health. Saffron is mainly known for its inclusion in other foods. But it has very important nutrients and chemical compounds that are useful in providing medicinal properties. Therapeutic applications In many religions, saffron is not just a spice. It is used in various types of therapy such as body healing, detoxification, as well as in spa for different aroma therapies. Antidepressant Active ingredients of saffron can act as antidepressants that soothe the body and heal the spirit. It promotes digestion Saffron is one of the favorite spices for a reason. In addition to improving the taste of foods, it has ingredients that regulate the digestion process. Heart diseases, blood pressure Potassium that is in high can be found in high amounts in this spice helps maintain blood pressure and protects against various cardiovascular diseases. Production of blood cells Iron is a very useful component in the body that blood requires to form hemoglobin and red blood cells. Since saffron has a large amount of iron, this makes it an ideal anti-anemia medicine. Skin Care Saffron is used in the cosmetics industry in a number of preparations. We will highlight some recipes for face mask that will make your skin shine. Mix 1 teaspoon of sandalwood powder, 2 to 3 spoons of saffron and 2 teaspoons of milk. Wash your face and wipe with a towel before applying the face mask. Apply the mixture on the face and massage the skin thoroughly in circular motion. Allow it to dry for 20 minutes and then rinse. This mask is applied once a week for maximum results. If you have dry skin, you can prepare a mask with lemon and saffron. The lemon cleanses the skin and the saffron gives it shine. Mix a few drops of lemon juice with a spoon of powdered saffron. If you have very dry skin, you can add several drops of milk. Apply a mask on the whole face. Leave it to stand for 20 minutes and rinse with lukewarm water. Treatment of acne and pimples Antifungal content of saffron makes it effective for the treatment of acne, stains and blackheads. Apply saffron soaked on your face twice a day and this can help you to clean stains and pimples. Add honey to saffron and massage your face with this mixture. This will stimulate blood circulation by providing oxygen to your skin. Regularly use this face mask and it will give you a glittering skin. Against hair loss Saffron can be mixed with licorice and milk and applied to the bald spots on the skin of the head. This will speed up the fight against hair loss and promote its growth. How to choose it in the store? Saffron is the most expensive of all spices, and the right choice is vital in order to gain quality for money spent. Saffron is available all year round in supermarkets and specialized stores. It is available in three shapes: stigma, powder or dried. When shopping, pay attention to color. There should be no traces of yellow, the redder the color, the better the quality of the saffron. The next step is a flavor test. It should have a strong and fresh smell. Saffron is an expensive spice so, if it's available at lower prices, it's probably of poor quality or maybe even fake. The saffron should be stored in a hermetically sealed container, preferably in a jar in a cool, dark and dry place. Like other herbs and spices, the saffron is sensitive to light so it should be wrapped in a foil or in an opaque container. It is advisable to use it within 2 years as it will gradually lose taste. Saffron is a versatile spice that can give a new dimension to salty and sweet dishes. You can also prepare tea with the addition of 5 to 10 strands of saffron in boiling water. This tea will have a clear aromatic aroma of saffron. WARNING: High doses of saffron can act as a stimulant to the uterus and in severe cases can cause an abortion. It is therefore advised that pregnant women avoid consuming it.